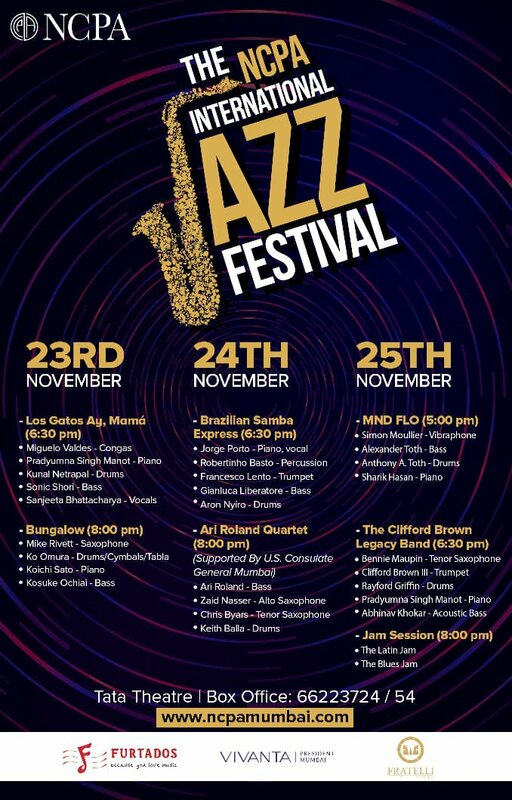 This may arguably be the best ever Jazz Festival ever held in Mumbai. It certainly will be the most diverse ever in terms of nations and different styles of jazz represented. There will be musicians from Brazil, Cuba,Japan, Australia, France, Canada, Italy, Hungary, India and from the USA. Where: At the Tata Theatre, NCPA, Mumbai. The headliner will be the Clifford Brown Legacy Band from the US, which features Benny Maupin, an alumni from the Miles Davis band and the grandson of the legendary jazz trumpet player, Clifford Brown. The Ari Roland Band from New York features two top quality saxophone players, while Australia's top ranked horn player, Mike Rivett is backed by a superb trio from Japan led by Ko Omura. Two Latin Bands, Los Gatos Ay Mama (featuring Cuban percussion maestro Miguelo Valdes and India's most famous Latin pianist, Pradyumna Manot) and The Jazz Samba Express from Brazil with pianist/vocalist Jim Porto and Robertinho Bastos on percussion plus 3 will set the tone for the exuberant rhythms from South America. The climax of the three day festival will be the two sets of jam sessions. In the first, the Latin band members from Los Gatos and Jazz Samba Express will face off on stage together. The other jam session set is the 'Blues Jam' where musicians from the festival will combine to bring out the best in each other in the classic tradition of a jazz festival.